What a week for free learning opportunities, all accessible from the comfort of your home! 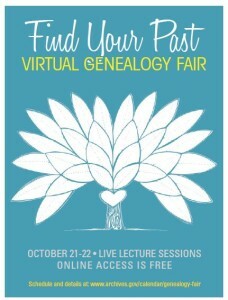 The National Archives will present its annual Virtual Genealogy Fair on 21-22 October 2015. If you aren’t near a calendar, the sessions are this Wednesday and Thursday. 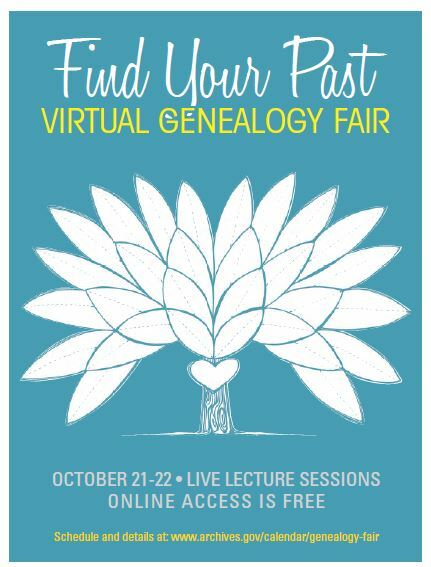 I have attended NARA’s Virtual Genealogy Fair in past years and have not been disappointed. There are five sessions scheduled per day, plus opening and closing remarks. Sessions are live-streamed via YouTube, and questions from viewers are allowed after the sessions. Genealogists of every experience level are offered a learning opportunity. For a schedule of presentations, handouts, and information on accessing the event, see the NARA website. Offerings include sessions on the Civilian Conservation Corps, preserving family records, migration routes, World War I veterans, bankruptcy records, and more. If you have had the genealogy education blues due to limited travel time, mourn no more. Online learning opportunities await. If you are unable to attend the live NARA sessions, catch the recordings, which will be posted online after the Fair. This entry was posted in Education and tagged NARA, Virtual Learning. Bookmark the permalink.